A team of UM students, faculty and mentors has earned one of 20 spots in the elite international Solar Decathlon Competition sponsored by the U.S. Department of Energy. It's the fourth time the Terp team has made it to the finals in the competition to build a house that is fully and creatively powered by solar energy. In 2007, Maryland's LEAFHouse entry led all U.S. designs and captured second in the competition. "This year's conceptual design, WaterShed, begins where LEAFHouse left off," says Amy Gardner, associate professor of architecture and principal investigator for UM's Solar Decathlon 2011 effort. "We have nearly 300 students from architecture, engineering, plant sciences, landscape architecture and other disciplines who will help bring it to life, in partnership with a multi-disciplinary faculty team." •	Building and finish materials that are beautiful, sustainable, cost-effective, and durable. "Our goal for WaterShed is to produce an eco-system whose efficiency comes from the interconnectedness of building, site, and the people who inhabit them," says Gardner. "In the past, teams have put in long, long hours and their dedication, creativity and collaborative spirit have been keys to our success. This year, the WaterShed project will benefit from the UM tradition of an integrated, inter-generational team, with voices both fresh and seasoned, encompassing a depth and breadth of mentors and students from varied disciplines." A series of Decathlon-related courses offered across the university, beginning in fall 2009 and continuing through fall 2011, form the base structure for UM students to get involved. Courses are offered in Architecture, Engineering, Communications and Bioengineering, and students can also volunteer to help on an extracurricular basis. Garth Rockcastle, dean of the School of Architecture, Planning and Preservation said, "The Solar Decathlon effort resonates with the school's priorities of sustainability and building craft. It also provides our students a unique opportunity to make connections with peers and mentors from other units within the University and building professions." UM is proud of its participation in the Solar Decathlon in 2002, 2005 and 2007. 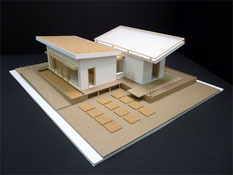 Team Maryland’s 2002 4th-place house demonstrated not only the practicality of solar energy in residential design, but also the ability of UM students to plan, manage and complete a major, multi-year interdisciplinary design project. The 2005 team built on that experience to create a house awarded 8th place, the People’s Choice Award, the BP Solar Innovation Award and a Safety Award Honorable Mention. And LEAFHouse, Maryland's Solar Decathlon 2007 entry, garnered second place overall, with first or second place in five of the individual contests, the Peoples' Choice Award and several industry awards including: the ASHRAE award for "Integration for Renewables for Sustainable Living" and the NAHB Marketing Curb Appeal First Place Award. The 20 teams selected for the Solar Decathlon 2011 are geographically and academically diverse, hailing from the U.S., Belgium, China and New Zealand and representing colleges and universities large and small. Team selection began with a call for written proposals in fall 2009, followed by a conceptual design submission in March 2010. The Solar Decathlon challenges collegiate teams to design, build and operate solar-powered houses that are affordable, energy-efficient and attractive. The competition's top prize will go to the team that best balances cost-effectiveness, consumer appeal and design excellence with optimal energy production and maximum efficiency.